Fingers Uncrossed!!! : BLOG NOW LIVE FOREVER!! When asked to introduce my Blogger’s identity and my blog as well at Indiblogger’s BNLF event, I said that it is the manifestation of my random thoughts, vis-à-vis technology which did not go shoulder to shoulder with a tech job earlier. Those two minutes of introduction were enough for the others to figure out who I am and what my blog is all about. It was nothing special that I specified, but the quest of every blogger to know each other better. 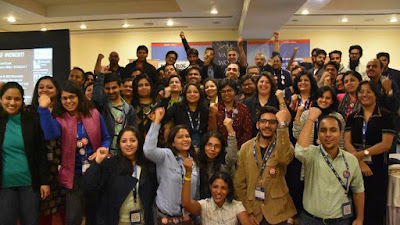 The Valley Of Words’ members, Indiblogger crew (as we were called 😊) and the team brought in a lot of vibrancy to the occasion. I would like to relive the memory through this post and hope it is equally evocative for other attendees. I landed in the mystic Dehradun hills and breathed the fresh crisp air of Doon valley at about 12:35 pm on 17th Nov’17. There was no looking back in the amazing moments that followed. Though my guest house was just a 5 minute walk from Hotel Madhuban on Rajpur road (where the event was about to start), I hardly spent time there. With all the hustle bustle in the Madhuban lawns, I resisted going back until Indiblogger team provided with safe crepuscular drive to my lodge. Though my eyes were still droopy and I longed-for sleep when I started with this post, more Indiblogger sessions is what I truly long for. The event kicked off with QR code based registration followed by distribution of Indiblogger badges. Since this was my first Indiblogger meet, my enthusiasm was similar to reporting for my first job and being issued with an I-Card or even more than that. As an introvert, I started moving around on my own, but the zest and small talk around persuaded me to exchange a few greetings. What followed half an hour later was bloggers dining together, speaking blog, clicking pictures and reveling at Bobby Cash’s euphonious guitar performance. Supper was succeeded by an introduction of bloggers which was a superb way to know each one of us. The blogger bond of togetherness was so cohesive that we even ended discussing next day’s plan together before heading to our humble abodes with excited puffy eyes. Though I couldn’t sleep very well that night (probably because of too much caffeine in my system! ), I was up and at the venue round 07:30 AM the next day i.e., 18th Nov’17 for the Ruskin Bond walk scheduled with “Been there Doon that”. I am not an avid reader of Ruskin’s work, but I got a chance to visit the bylanes he’d been in yester years writing and know the life that he’d lived in Dehradun before heading to London and finally Mussoorie. It was a pleasurable walk midst greenery and aged structures. Next, followed a scrumptious breakfast at Bikanerwala consisting of chhole bhature, grilled sandwich, idli sambhar, cuppas of coffee and lassi to go with. Not to forget lots of instagrammable images which still make me reminiscent of my journey. Without spending more time speculating, we headed to Forest Research Institute, Mindrolling Monastery and the very famous Paltan Bazaar (which indeed reminded me of Delhi bazaars). For me it was a good respite from smoggy and cloggy Delhi and an opportunity to soak in the Sun, the pristine blue sky. The architecture of FRI and colours of monastery were rejuvenating too. Next, we headed back to the venue not knowing really what’s in store for us. There were few speeches from VOW’s illustrious speakers who were very impressive and motivational at the same time. Post feast and music, the real Indiblogger magic began with my first hurr-hurr rendezvous. Keynote speakers and their experiences were very edifying and enlightening. Blogging ways and debates were also interesting. Indiblogger games and other informational talks kept the energy and tempo very high. To be true, never was I that attentive post my college days as in those sessions. Time and sleep were taking a leap on our bodies but souls refused to return to their dwellings. After multiple clicks and goodbyes and promises to meet soon, we finally bid adieu to each other. I went all alone by myself, but met wonderful, warm and creative writers and returned with memories to be cherished for long. I rest my itchy fingers on this note. Do let me know your take and comments on this. It was a wonderful few Doon days, with many memories now. :) Loved each and every moment of it. Nice to know everyone had a wonderful time. You sound very excited even while recounting the experience so trust it was a great success! Loved reading your account of the event Shilpa. It was lovely meeting you and I hope to stay connected with you. Thanks Kala! Surely... will be in touch !! Nice account of BNLF! It's good to hear of the event from different perspectives. Those were a couple of great days that will always be cherished in the memories. THE BLIND DATE ::: WANDERLUST!!! BOUNTY OF NATURE WAITING TO BE BOTTLED!!! PRAY OR PREY : WHICH WAY?? CASUALTY ::: TIME AND LIMBS !!! !